The fall is the time to be outdoors as the summer temperatures wind down to cooler, more tolerable days. Now is the time to plan on picking apples! You may have your own trees, but if not, take a trip to your local apple orchard and enjoy the peaceful time you can have and the rewards that later come out of the kitchen. 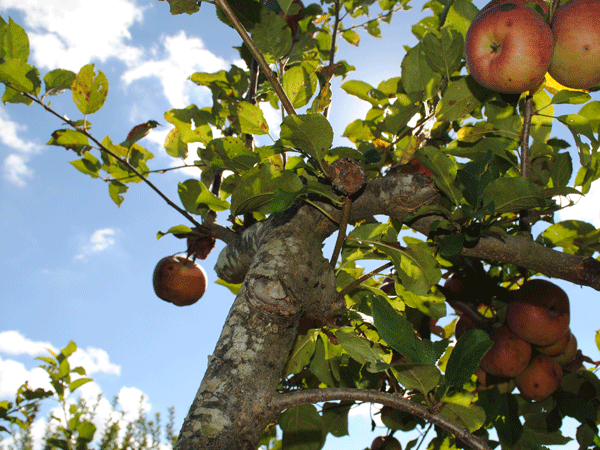 Apple Festivals start in September and go into the end of October and first part of November. 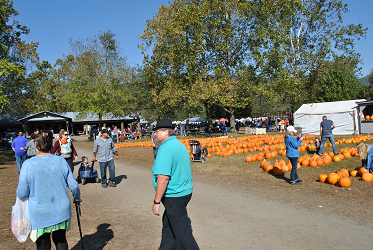 We went to Graves’ Mountain Harvest Festival in Syria, Virginia last weekend. 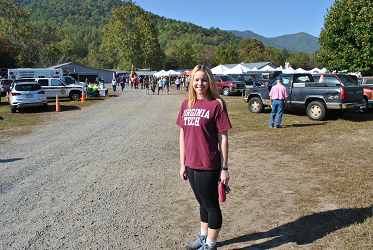 We had a fun time getting out and seeing the beautiful scenery, getting to sample some of the festivals treats and listening to good bluegrass music by The Flatland Bluegrass Band. The festival has proven to be very popular, so much so that the apples had been picked clean by the time we made it last weekend. We were told that this was going into their fifth weekend and they had seen thousands of people come to the festival. We still had a good time walking around the farm and petting the livestock. They have horses that you can take on trail rides, and they also have hay wagon rides and even small ponies for the very young. We ended up getting half a bushel of apples from the apple crates that they had on hand. I can vouch for how good they are in pies, we have already gone through one pie in a day and half. I had help. The great thing about an apple is not only that it tastes good but is good for you. Research has gone into the apple’s antioxidant benefits, cardiovascular benefits, benefits for blood sugar regulation, anti-cancer and asthma benefits. With such a starring role it is hard to not like the apple. When you shop for apples you will generally see just a few types, that is because the apples that consumers buy are generally just pretty apples. Looks are more than apple-skin, deep. Most shoppers look for the red, perfectly shaped apple. There’s nothing wrong with that, except you may be missing out on other varieties that may not have the shelf appeal but the taste is where they shine. You will not see some of the heirloom varieties in the stores. You have to go to orchards to find those such as the Wolf River, Newton Pippin, and the Snow just to name a few. Some varieties are better for cooking and some for just plain eating. It is hard to go wrong with eating an apple a day. They are good for your gums and teeth, good for digestion and other health benefits from the nutrition they give us. When I think of apples I really enjoy this time of year going to an apple orchard. 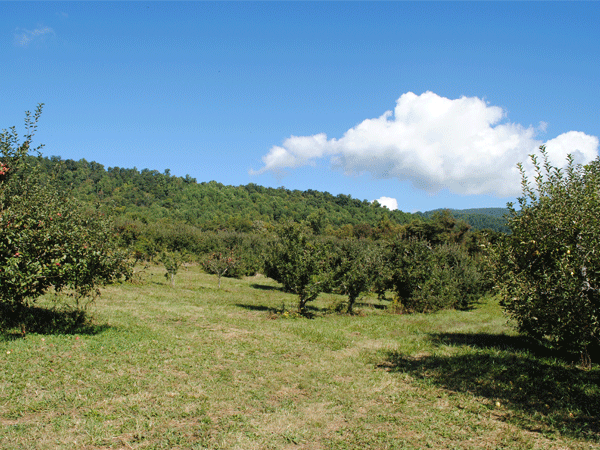 Around Virginia, you will find outstanding produce along with scenery. 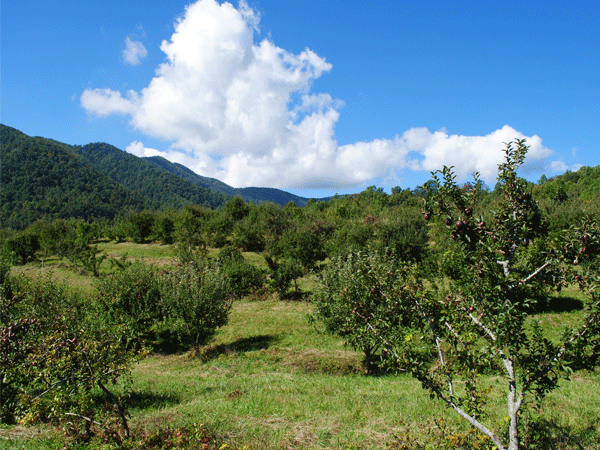 My girls and I like going to Graves Mountain Lodge in Virginia to pick apples. They offer pick your own apples fresh from the trees. Varieties include: Red Delicious, Golden Delicious, Stayman, York, Winesap, Mutsu, Fuji, Granny Smith, Rome, and Empire. As you can see from the pictures, they have breath taking views. 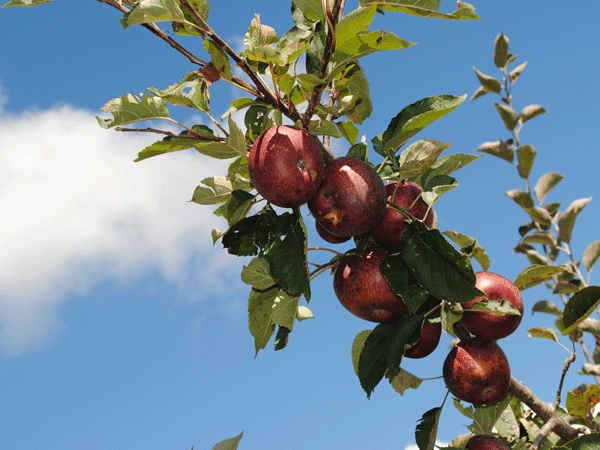 If you wonder about how many to pick, a bushel of apples is about 48 pounds. Take the time to take the kids or grandkids outdoors, let them run around and get some fresh air and enjoy the fall festivals. In the 1994 blockbuster movie, Forrest Gump, Forrest’s friend, Bubba , enthusiastically educated him about all the ways to prepare shrimp. And there were quite a few! However, if any food can rival shrimp in the number of ways it can be prepared, the many varieties of the humble apple would certainly be at the top of the list. Most families have a favorite apple pie recipe, and more than likely, apple pies are probably the most popular way to make use of apples. However, as delicious as they are, they can be a bit labor-intensive, especially if you prepare your own pastry for the crust. 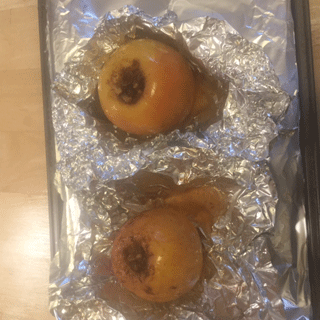 So, if time is not on your side, here are two recipes that can be prepared fairly quickly, filling your home with the wonderful autumn aroma of cooking apples and spices in short order. Melt two tablespoons butter in the microwave oven in a small, microwave–safe bowl. Add the brown sugar, honey, cinnamon, raisins or dried blueberries and walnuts. Stir to combine. Bake for 40 to 45 minutes. This time may vary due to differences in ovens, or in the size of your apples. Remove from oven, cool for at least five minutes, then unwrap from foil and serve as is, or with whipped cream or ice cream. (or 9 by 12 inch casserole, or large deep-dish pie pan), sprayed with canola or vegetable cooking spray, or greased with butter. Preheat oven to 350 degrees. Peel and core apples. (This is the most time-consuming step. 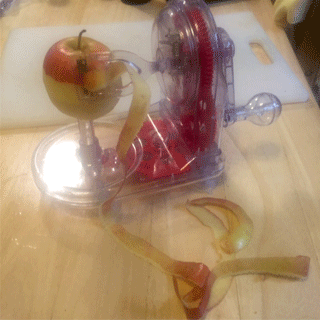 However, I have a handy, little device that peels the apples lickety-spilt, then I core and slice them with an apple corer/slicer. 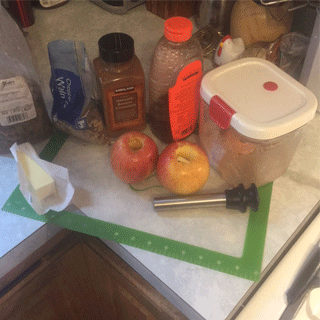 If you cook a lot with apples, or can applesauce, you may consider investing in a device that either peels and cores, or just peels apples.) 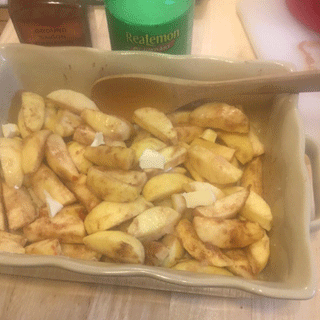 Place the sliced apples in the greased casserole, and sprinkle the granulated sugar, flour, and 1 teaspoon cinnamon. Toss to coat and mix, right in the casserole. Dot the top of the apples with a tablespoon of butter, cut into small pieces. Melt butter in microwave using a medium-sized, microwave-safe mixing bowl. 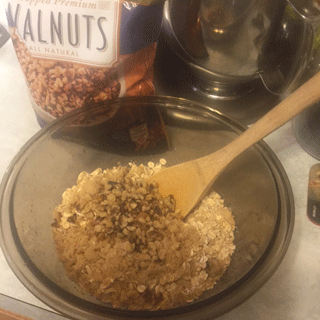 Add oats, brown sugar, 1 teaspoon cinnamon, and walnuts. Mix well to combine. 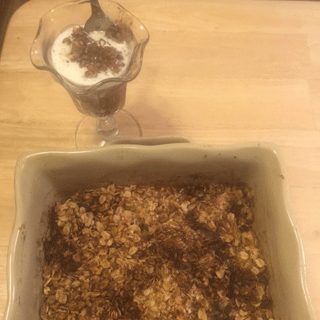 Cover the apples in the casserole with the oat mixture. 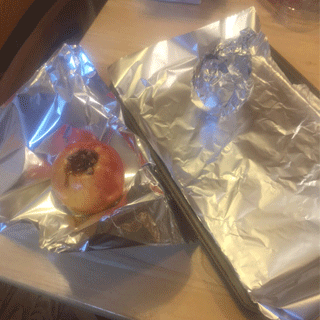 If you feel the topping is becoming too brown before the apples are cooked all the way through, cover with foil for the rest of the baking time. Serve as is, or topped with cream, whipped cream, or spoon on top of your favorite ice cream! With both of these recipes, the walnuts can be substituted with chopped pecans. Although the nuts are optional, unless you or a family member just does not like nuts, or is allergic, they make the finished product even more delicious. Use only fresh, ripe apples to get the best results. Apples vary in their natural sweetness. 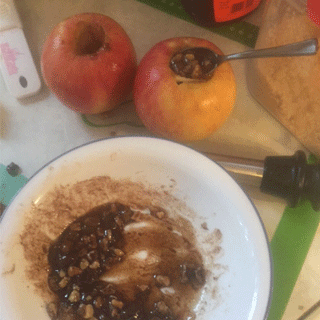 When using sugar in any apple recipe, adjust according to taste. 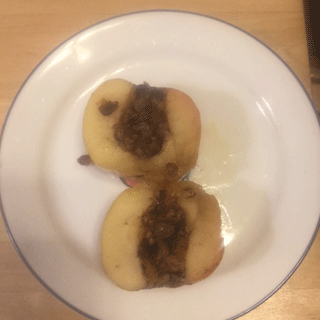 Some apples may require little or no sugar, others more than what is stated in the recipe. Baking times and temperatures can often vary due to the variety, size, and freshness of your apples. It is a good idea to check on your recipe while the apples are cooking to prevent over-browning of crusts or toppings. Mixing up different varieties of apples in pies, applesauce, or apple butter often makes a better tasting final product. 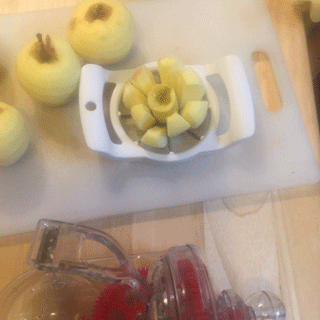 A gadget such as an apple peeler/corer can be well-worth the investment if you bake a lot with apples, or can or freeze applesauce. “Best Apples for Baking.” Best Apples Baking Cooking. N.p., n.d. Web. 29 Sept. 2015. “Apple Harvest.” Graves Mountain Lodge. N.p., n.d. Web. 29 Sept. 2015. “U.S. Apple Association.” U.S. Apple Association. N.p., n.d. Web. 29 Sept. 2015.